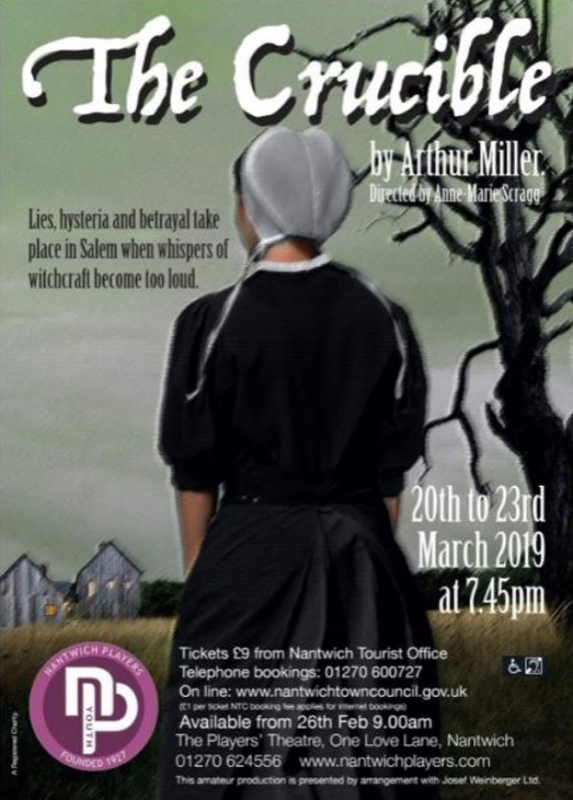 Nantwich Players Youth Theatre bring you the timeless classic ‘The Crucible’ By Arthur Miller. Written in the early 1950s, the play takes place in Salem, Massachusetts during the 1692 Salem Witch Trials. This was a time when paranoia, hysteria, and deceit gripped the Puritan towns of New England. Miller captured the events in a gripping story that is now considered a modern classic in the theatre. He wrote it during the “Red Scare” and used the witch trials as a metaphor for the ‘witch hunts’ of communists in America. The Crucible has been adapted for the screen twice. The first was in 1957, directed by Raymond Rouleau and the second was in 1996, starring Winona Ryder and Daniel Day-Lewis. Arthur Miller was himself a victim of the twentieth century witch-hunt, otherwise known as the anti-communist crusade led by Senator Joseph McCarthy. McCarthy’s ruthless House Un-American Activities Committee wrecked the lives and careers of hundreds of US citizens in the ‘50s, and Miller’s play was a direct response to its injustice. The Crucible remains just as relevant today, just as Miller suspected it would.